Newsquest is proposing editorial cuts of 20 per cent at the Herald titles in Scotland and across the Romanes Media Group titles which it bought in May. According to the National Union of Journalists some 20 jobs could go on the Herald titles in what is a third round of job cuts in the space of ten months. The Sunday Herald was yesterday the only local weekly newspaper in the UK to increase sales year on year. 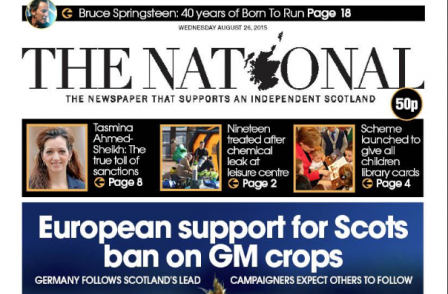 The other titles in the group include The Herald, the Evening Times and pro Scottish independence daily The National. The former Romanes Group titles include the daily Greenock Telegraph as well as 19 paid-for weekly newspapers in Scotland, Northern Ireland and Bekshire. The NUJ said of the Romanes Group titles: “This small but successful publisher turned a deficit to a profit of over £4m in the past five years, using traditional methods of selling newspapers and advertising space. NUJ Scotland organiser Paul Holleran said: “This treadmill of redundancies cannot continue. I have told Newsquest it is not sustainable to keep cutting jobs without putting a robust alternative structure in place. In a letter to the union, the company said “newspaper revenues are declining and there is a need to cut cost and increase efficiency”. However staff said the current lack of efficiency, with many journalists working excessive hours because of serious problems with staffing levels, was a result of poor management. An NUJ chapel meeting of staff working at The Herald, Evening Times and Sunday Herald voted unanimously to hold a ballot on whether to take industrial action including strike action.